But Violet, Dougie, Becky, and even Bear have secrets—lots of secrets. An entire world of secrets, as Treenie is about to discover in this young-adult novel. 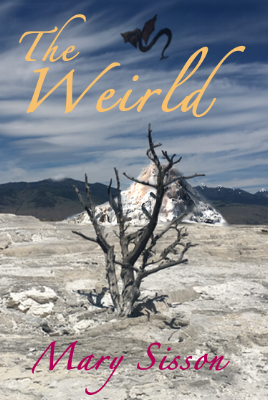 A spell goes wrong, and Treenie finds herself in the magical, strange, and dangerous land her siblings have dubbed The Weirld! Available as an e-book at Amazon, Barnes & Noble, Kobo, or Smashwords, as a paperback at Amazon or Barnes & Noble, or as a large-print paperback at Amazon! "Trang is a clever return to the social sci-fi of yesteryear." Diplomat Philippe Trang has problems—lots of problems. Haunted by a recent mission on Earth that went very wrong, Trang is the first human diplomat assigned to a mysterious alien station. He quickly realizes that not everyone on Earth would like to see his mission succeed—and the several alien species have some nefarious agendas of their own. As he tries desperately to keep everyone from killing each other (not to mention him), strange forces threaten to destroy his very mind! "If you enjoy anthropological sf, and you aren't put off by the language, this one might be for you." You can get Trang as an e-book for FREE from Amazon (readable on the Kindle, iPad, iPhone, Android, Blackberry, PC and Mac), Kobo, Barnes & Noble, and Smashwords. Trang is also available as an e-book at Amazon's international sites. The physical book (readable in sufficient light) is available at Amazon, Barnes & Noble, and many other retailers. The large-print edition, which is as APH compliant as I could make it, is available at Amazon. "This will definitely be a series to keep up with." The e-book is available at Amazon, Kobo, Barnes & Noble, and Smashwords, as well as Amazon's international sites. The physical book is available at Amazon, Barnes & Noble, and many other retailers. The large-print paperback is available at Amazon.